Maruti India is all set to cement its place in all the segments of the Indian automobile market with the launch a brand new multipurpose vehicle, Maruti Ertiga on the 12th of April. The company is one the leading car makers in the country and their vehicles hold a very good reputation across the country in terms of performance, reliability, affordability and fuel efficiency as well. This new MPV is expected to have an aggressive price tag to take on all the contenders in this segment. 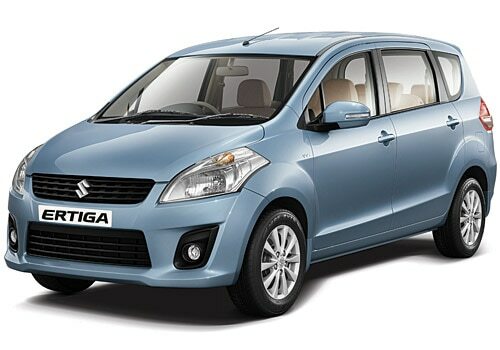 The Maruti Ertiga price is expected to be around the range of Rs. 7 lakh, ex-showroom New Delhi. This MPV is very stylish with a striking front fascia and the rear end has also been designed very tastefully as seen in the Maruti Ertiga pictures. There is a lot of space inside and the Maruti Ertiga can accommodate at least seven passengers on 3 rows of seating arrangement. The radiator grille houses the company’s logo and the head lights are broad and are integrated with the turn indicators as well. The mileage of Maruti Ertiga is quite healthy with the petrol variant giving 16.02 Kmpl, while the diesel model can generate 20.77 Kmpl as claimed by the company. The engines are also quite powerful and apt for the Indian road and traffic conditions. According to a Maruti Ertiga review, the petrol version is capable of displacing 1372 CC combined with a power of 95 Bhp and a peak torque of 130 Nm. Whereas, the diesel version houses a 1.3 liter turbo charged diesel car motor capable of churning out a thumping torque of 200 Nm along with a peak power of 90 Bhp. Both these versions have a 5-speed manual transmission gear box and come fitted with 4 cylinders. This 4 cylinders car is surely going to be a best seller as the other vehicles from the commendable fleet of Maruti India in the country.The Utility market is going to heat up with cars from major auto makers like Chevrolet Captiva from General Motors and Tata Safari Storme from the home grown car maker, no doubt a few sparks are going to fly.